Having a wedding anniversary on Valentine’s Day is not at all like having your birthday on Christmas. As a husband, you are expected to come up with new and interesting romantic ways to celebrate the event. After 20 years, even a great planner like me may come up short. Thankfully, this year’s trip to Arizona was beyond expectations. The plan was that we take a long weekend, fly to Phoenix, drive to Sedona, take a Jeep tour, See some sunsets, see some Indian ruins, drive the entire South Rim of the Grand Canyon (and back), then fly home to the East Coast. All of this to be accomplished in three days. No problem. The drive to Sedona from Phoenix is mainly punctuated by two things. The temperature drops 10 degrees and the Saguaro cactus disappears at 3000 feet of altitude. We stopped at the Montezuma’s Castle National Park. I chose this park out of so many Indian ruins in Arizona simply because it was on the way to Sedona. I wasn’t disappointed. This is really a very tranquil location and you’ll be much rested after your short walk around the loop. The main feature is a pueblo built into the mountain about 70 feet up. You can’t enter these days but you can get some photos (with your zoom lens). I also managed to become a Junior Ranger in the lodge by associating tracks and the animals that made them. I embarrassed my wife for a few hours wearing the badge that came with the rank. We stayed at a B&B in Sedona which charges a bit extra since it has a view of the red rocks. The mountains are spectacular, even better than the Grand Canyon, and, at twilight, the shadows make the colors jump out. We had arranged a rugged Pink Jeep tour of the hills of Sedona for the afternoon. The views from the Jeep were only out done by the steep climbs and drops that our driver put us through. I would recommend taking this tour though as the drivers are very skilled and, often, very knowledgeable about the geology of the area. I actually learned quite a bit about rock formations and why the rocks are red. You have to take your own tour to find out the answer. It was on the tour that we came up with our first problem. The guide at Montezuma’s Castle told us we would be “foolish” to drive the South Rim from east to west. We should rather go up through the mountains of Coconino for the morning views, go to the village in the west and then on to the Watch Tower in the east for the sunset. Doing this, we would likely miss the Wupatki ruins. I had planned to see the ruins as they are one place in the US that has a blowhole. A blowhole is caused by a huge underground cavern. When the temperature of the outside air is different than the cavern temperature, air will either enter or leave to accommodate the difference in pressure. Pretty cool! The Jeep guide told us to go to the Wupatki ruins, then first morning light at the watch tower, make one stop at Grandview Point and continue on to the village and Hermits Rest for the sunset. In the end, the blowhole was too much to pass up. One nice feature is that, to get to Wupatki, you have to pass through Sunset Crater National Park, the site of a volcanic eruption and lava flow. There are a few miles of lava-covered fields and ash mountains. These were really terrific to see and my wife, who is normally unfazed by nature, was blown away. When we arrived at Wupatki, I learned an interesting fact; many National Parks are available for entry even if they are not “open”. You can enter the park with no fee as long as you arrive before there is anyone there to pay. We toured Wupatki and learned about the site. There are pamphlets available for free – all you need to do is return them to the box. The drive up to the watch tower was fairly short after Wupatki and we arrived at about 10am, with some morning light still left for goods photos. The Grand Canyon is … well… grand. You feel very small at the edge of a structure that large. The Watch Tower is the easternmost view on the South Rim and you’ll need to take Route 64 up to the East Gate to get there. I would suggest to anyone to start at the Watch Tower on the South Rim where your first views will include that historic building in your frame. 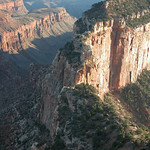 That helped me put the scale of what I was seeing in perspective which is not easy with vistas like the Grand Canyon. The gift shop is nice too. We were concerned with timing the sunset so we went on to Grandview Point for the vista. The light was still spectacular. There is quite a bit of washout on the photos – your camera simply can’t see the colors that are there. It was amazing. We went straight from there to the village, where many of the lodges are. There is a fair amount of shopping here as well. I was expected to find the ideal Anniversary gift for my wife by perusing the higher priced shops. I ended up finding a beautiful coat there that wasn’t available in her size. I, of course, ordered it online at once and saved myself $20. Thank goodness for iPhones. We did take a small hike down the Bright Angel trail. Many tourists do this trail since, at the beginning, it is reasonably easy. There were some warning signs suggesting we not start too late in our trek to the bottom of the canyon. No worries – I wasn’t planning that anyway. We turned around after it became too muddy. My wife is a city girl and a bit of mud is enough to bring us back for more shopping. We ended up at Hermits Rest for the sunset. It was a bit disappointing that the restaurant at the end of the road was closing at 5pm. It would have been nice to sip some nice wine and enjoy the sunset. The Grand Canyon is strangely not touristy at all at this time of year. I understand you can’t drive to Hermits Rest after March because they insist you take the shuttle bus. The drive back to Sedona was late, uneventful and mostly pitch black. I had convinced my wife that she needed to see another Indian ruin so we planned an early start back home. The stop was called Montezuma’s Well and was recommended by a shop owner in Sedona. The site is a small bowl, maybe 200 feet across, into the side is built a pueblo. At the bottom of the bowl is a clear lake. The interesting thing is that it is an oasis for many creatures in the area. Coming early as we did allowed us to see many animals that are normally hidden; bird & snakes. This is also a very peaceful site and I would have liked to stay longer. I also took advantage of my new rule and arrived before the warden, eliminating any fees normally associated with the visit. Back home, we feel like it might have been a dream. I do have hundreds of pictures to go through. I have to tell all my friends about it. I have to post on Flickr & Facebook. I have to write to my Dad because he won’t go on Facebook. I also have to… plan next year’s Anniversary trip. David Elwood is an avid scuba diver, leisure traveler and cancer survivor. He has traveled extensively to witness the wonderful things the world has to offer . His latest hobby, travel photography, continues to take him to faraway places. You’re a saint! I’m not sure there are many other husbands out there that would go through all that effort each and every year for their wife. You do all this for your anniversary which is amazing considering you also have to deal with the birthday “month”. You keep this up and not only will you make all other husbands look bad but their wives will want to clone you for their own. NICE JOB!! !